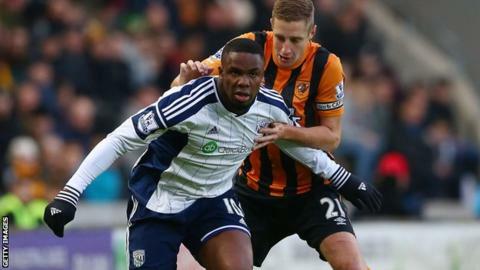 Hull City slipped into the bottom three of the Premier League as they were held to a goalless draw by West Brom. The hosts were indebted to goalkeeper Allan McGregor, who saved a ninth-minute penalty by Graham Dorrans. It was awarded after Mike Oliver ruled Jake Livermore had fouled striker Victor Anichebe as he tried to turn. Stephen Quinn had the best chance to break the deadlock for Hull when his low header in the second half was well-saved by Ben Foster. A game of few chances began eventfully as Anichebe appealed for a foul on the edge of the penalty area after Michael Dawson tugged his shirt. His appeals were waved away but, moments later, he was in the thick of the action again. Anichebe was fouled by Hull midfielder Livermore and this time referee Michael Oliver had no hesitation in awarding a penalty. Dorrans stepped up to take the spot kick, but McGregor got both hands to his right-foot side foot as he dived down to his left. It was the second penalty the Scotland international has saved in the Premier League this season - the first came on the opening day of the season against QPR. And he also made sharp stops from Craig Gardner's free-kick and an injury-time drive from outside the area by substitute Silvestre Varela. Hull, though, had the best chance of the second half when Stephen Quinn met Livermore's ball into the area to force Foster into his first save just before the hour. Hull City manager Steve Bruce: "When you get a point away from home, you think it's a good result. But at home it's disappointing as you really want to do well against the teams around you. "We found it difficult and we're indebted to our keeper. It's been a difficult run we've been on, but a point today might be the one that keeps us in the division." West Brom manager Alan Irvine: "It's good that we've stopped the run of defeats. But if we score the penalty early then everything could've been so different. "Hull are scrapping at the moment, so we knew it would be difficult. But our players battled very hard and they can be pleased with how they performed today." Match ends, Hull City 0, West Bromwich Albion 0. Second Half ends, Hull City 0, West Bromwich Albion 0. Attempt saved. Silvestre Varela (West Bromwich Albion) right footed shot from outside the box is saved in the bottom right corner. Assisted by Saido Berahino. Attempt blocked. Abel Hernández (Hull City) left footed shot from outside the box is blocked. Assisted by Jake Livermore with a headed pass. Youssuf Mulumbu (West Bromwich Albion) is shown the yellow card for a bad foul. Attempt missed. Nikica Jelavic (Hull City) header from the centre of the box is close, but misses to the left. Assisted by Tom Huddlestone with a cross. Offside, West Bromwich Albion. Youssuf Mulumbu tries a through ball, but Brown Ideye is caught offside. Attempt missed. Tom Huddlestone (Hull City) right footed shot from outside the box misses to the left. Assisted by Jake Livermore. Substitution, West Bromwich Albion. Brown Ideye replaces Craig Gardner. Substitution, Hull City. Nikica Jelavic replaces Sone Aluko. Attempt missed. Abel Hernández (Hull City) header from the centre of the box is close, but misses the top left corner. Assisted by Robbie Brady following a set piece situation. Substitution, West Bromwich Albion. Saido Berahino replaces Victor Anichebe. Attempt saved. Craig Gardner (West Bromwich Albion) right footed shot from outside the box is saved in the top left corner. Substitution, West Bromwich Albion. Silvestre Varela replaces Stéphane Sessegnon. Offside, Hull City. Sone Aluko tries a through ball, but Robbie Brady is caught offside. Attempt saved. Abel Hernández (Hull City) right footed shot from the centre of the box is saved in the bottom right corner. Attempt blocked. Michael Dawson (Hull City) left footed shot from the centre of the box is blocked. Assisted by Jake Livermore. Corner, Hull City. Conceded by Joleon Lescott. Substitution, Hull City. Robbie Brady replaces Liam Rosenior. Substitution, Hull City. Andrew Robertson replaces Stephen Quinn. David Meyler (Hull City) is shown the yellow card. Attempt missed. Tom Huddlestone (Hull City) left footed shot from outside the box is high and wide to the left. Attempt saved. Stephen Quinn (Hull City) header from the centre of the box is saved in the bottom right corner. Assisted by Jake Livermore with a cross.